Alphabet-owned Google is scheduled to complete three underwater cables in 2019 in an effort to expand its cloud business worldwide. The move will provide more support to companies using cloud services, including advertising agencies and the brands they support. Google will commission the work. The first of the three submarine sea cables will run from Los Angeles, CA to Chile. The second cable will connect the U.S. to Denmark and Ireland. The third will connect Hong Kong to Guam. Ben Treynor Sloss, vice president of engineering at Google, in a blog post. 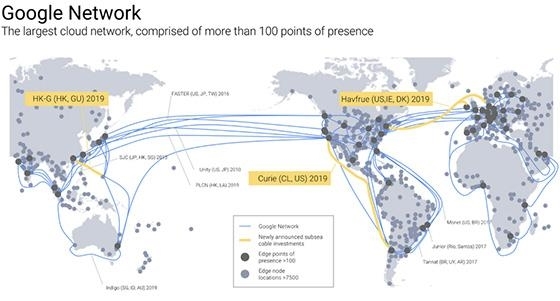 Unity, was intended to address the need for broadband for data and internet traffic between Asia and the U.S. At the time, the project would add up to 7.68 Terabits per second (Tbps) of bandwidth across the Pacific. The move would put Google — which has invested $30 billion in infrastructure during the past three years — in a better position to compete against Microsoft and Amazon. project, known as MAREA, was scheduled for completion in October 2017.
announced an expansion of its cloud partnership with Comcast to deploy new applications on Amazon Web Services. Comcast’s primary businesses, Comcast Cable and NBCUniversal, currently run on AWS.